In the past two years, my body has changed. Part of that is down to being over 30. Part of it is my change in sports--no more running and swimming! Part of it is that I don't teach yoga multiple times a week anymore, and my flexibility from the time when I did teach 5-8 classes a week has now completely worn off. 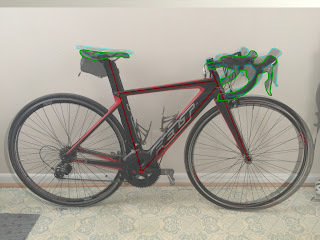 When I first got my Felt AR5, I had a bike fit at my local shop Tri360 (which has since closed). The fit was from a F.I.S.T.-certified fitter, developed by SlowTwitch.com. The F.I.S.T. fitting system is very tri-centric, designed at a time when most bike manufacturers weren't developing bike geometries specifically for cyclists who need to be super-aero but also need to be able to run after riding. Which is to say that my bike fit, while very helpful for the Ironman training and racing that I did right after I got it, didn't suit my new path as a roadie. In fact, when I started road riding and racing again last winter, I re-tooled my fit on my own to be more road-friendly--both to increase my comfort and handling confidence for road riding and to stop my teammates from making fun of my triathlete fit. But over the course of the past year I've gotten less and less comfortable on my saddle (a Cobb Gen 2 that was great for a TT position, but not very nice to my hoo-ha with a more laid-back road position), and I felt like I was limited in how low I could get over my bike. I tried messing with my handlebar position, my hood position, my saddle set-back; I had an overwhelming feeling, even after short rides, that I could be much more comfortable on my bike if I changed things around, but I was too lazy to put the time and effort into dialing my fit in myself. So I outsourced the task to my sponsor bike shop, Spokes, Etc. Enter Anna, Spokes's pro fitter! Anna is certified through Specialized's Body Geometry fitting program. I've been fit by a Specialized fitter before (back when I got my Specialized Transition). I like the Body Geometry system! It seems very thorough, much more so than the F.I.S.T.ing system (and yes, I know), like it takes more components of my individual body into account. Here's a little before and after. See if you can tell the difference. This is actually from right after I bought the Felt, not right before the fit, so it's not exactly how I had my bike set up before Anna worked on it. And we live in a different house now. Notice the change of flooring! There aren't a lot of obvious differences, although the one that stands out to me the most is the different in reach. The stack looks lower in the second picture, doesn't it? That's weird, because the saddle is much higher now than I had it right before. Saddle is lower, handlebars and stem are lower and rotated towards me slightly. I'm now on a Specialized Power Saddle and it's working for me pretty well. It's still not perfect, because balancing on a few inches of plastic/carbon and leather for several hours is not comfortable. But the saddle seems to hit me in better places, and I've had less trouble with chafing and saddle sores since switching from the Cobb saddle. I can get really low with this fit without my chest and ribcage getting in the way of my legs. Some of the soreness in my piriformis and right hamstring has cleared up, too. This fit has worked out really well for me (and it's roadie-approved)! Big thanks to Anna and Spokes, Etc. for the much-appreciated service! If you've never been professionally fit, I recommend it. It'll run you $100-$200, depending on the shop you go to, but it makes a big difference in how you feel on the bike. For my money, not having saddle sores and chafing in my lady-parts is well worth the cost (and it's an easy sell for spouses/partners if you have to convince them that you need to spend the money, if you know what I mean). Most shops will give you a free or discounted bike fit after you buy a bike from them, so check into that if you're in the market for a new bike. I'll try to pull together some information on bike fitting and saddle choice soon, so if you can't swing the cost of a pro bike fit you can try to at least improve your position on your own. With that, thanks for reading! PSA: Always Check Before You Ride!